The first herb I ever befriended was comfrey. Indeed, the first herbal medicine I made was comfrey salve. 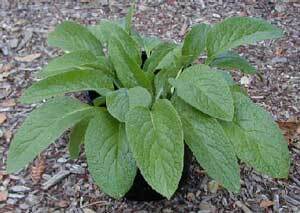 Comfrey is a lovely, easy to grow plant that is well-known for its tenacity to live. Careful selection of its place in the garden is called for since comfrey easily sprouts from small pieces of its root. Although I have limited my personal use to topical application on wounds and abraded skin, many herbalists and physicians prize comfrey for the treatment of broken bones, torn cartilage, tendon damage, lung congestion and ulceration in the gastrointestinal tract. These applications have not been tested in clinical trials although there is research supporting anti-inflammatory [3-8], analgesic [9-10], would healing [9,11], and immune modulating effects [15-17]. The major barrier to testing this plant's therapeutic effects is the naturally occurring pyrrolizidine alkaloids (PAs) in comfrey. Due to the presence of PAs many countries have laws restricting the distribution, sale, and/or use of comfrey. This includes the United States, Canada, Germany, and the United Kingdom. Despite the concerns regarding PAs in comfrey and the risk of liver damage many alternative medicine practitioners and the lay public continue to eat or use comfrey as medicine (much as people demanded the continued availability of diet products containing saccharine even after it was shown to cause disease in laboratory animals). In light of conflicting opinions regarding comfrey safety, I set out to critically evaluate the available scientific literature with hopes of determining the safety of comfrey. This web site summarizes my findings and presents a great deal of the actual research and some additional background material to make the research more understandable. This presentation was developed to allow the site visitor an opportunity to draw their own conclusions regarding comfrey. The conclusions I have drawn can also be accessed.